Single chamber, self priming, heavy duty diaphragm pump 24V for waste water. Black water transfer or pump out. Capacity 32 L/min (8,5 GPM), flexible installation with 360 degree rotational ports. Quiet operation and low power consumption. 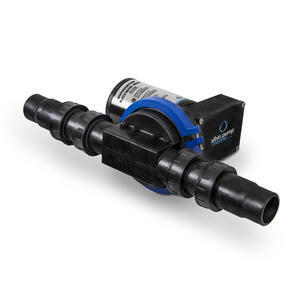 Operates with no need for filter, equipped with double non-return valves. Including 38mm (1,5") straight and 90 degree rotational connectors. 3A fuse. Interchangeable with Johnson Pump 10-13373-04.